The debate between smoking versus vaping has a longstanding history, but for those who prefer vaping for health reasons or for mitigating the harsh cough that comes with smoking, knowing how to make a homemade vaporizer is priceless knowledge. Long-time cannabis users know the frustration of having plenty of weed yet nothing to smoke it with, but the pros know how to take some of the most basic household items to engineer a homemade vaping device. Even newbies who have never used a vaporizer before might have an interest in making a homemade vaporizer, especially since the commercial ones that are truly worth the investment can also be quite costly. Considering vaporizers are better for your health and homemade vaporizers are easy and cheap to make, knowing the basics of making a homemade vaporizer is simply good information to add to your repertoire of cannabis culture. A vaporizer is basically any device that uses heat to release the active ingredients of the weed. There are many commercial vaporizers with digital temperature readers, but basic and functional vaporizers can also be made at home. Vaporizers are a healthier method of cannabis use in comparison to smoking, and the effect of inhaling vapor is a smoother pull and less lung irritation. Vaporizers work by heating up the weed to release the active ingredients in vapor form. While smoking weed involves combustion and releases the active ingredients through smoke, (which can lead to harmful effects including lung damage, burning the back of the throat and esophagus, and exposure to carcinogens), vapor only heats the herb. The pleasurable effects of vaping are the same as smoking, if not superior to smoking since vaping is significantly less harsh and less likely to induce fits coughing fits. There are many ways to make a homemade vaporizer, and the basic elements that are required are a sealable container that can be heated, a knife or scissors for cutting, two tubular items for inhalation and ventilation, and a heating element. 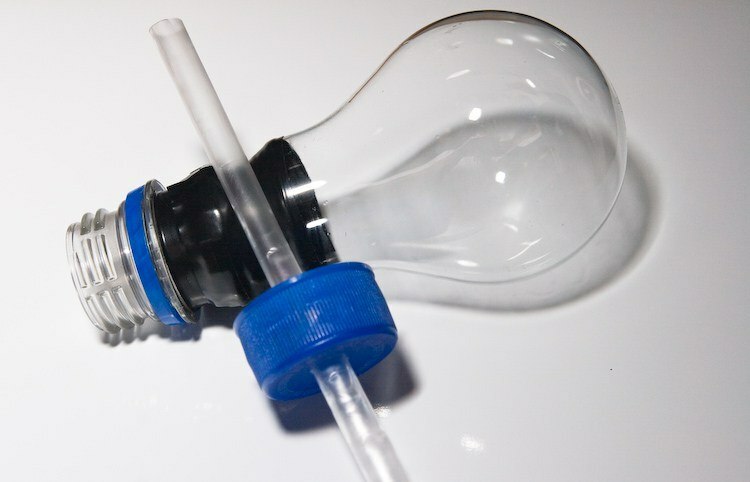 Below are two of the most common methods – a vaporizer using a lightbulb and a vaporizer using a mason jar – for making a homemade vaporizer using regular household items. While the light bulb method probably requires the least preparation, it is also more suitable for individual users or smaller groups. The mason jar method might require a trip to the hardware store, but it is also easier to share in a group. 1) Using the scissors, cut the end of the lightbulb off, making sure to remove all the black glass at the bottom. If the edges are smooth, it will be easier to put the bottle cap on later and get a more airtight seal, but it’s not a big deal if the edges are not perfectly smooth. 2) Remove the filament from the lightbulb. This part can be tricky, and you’ll want to handle the bulb with care so that it doesn’t break. Using either the screwdriver or the pliers, or both, pull out the filament wiring from the lightbulb. For a visual demonstration of cleaning out a lightbulb, check out this video down below. Make sure all the glass and contents are completely emptied out of the lightbulb. You can wash the bulb out too, but then you must wait for it to dry completely. 3) Take the plastic bottle cap and use the knife make two holes in the top. The holes should be big enough for the straws or pen tubes to fit into. If handy, a drill can make this process even easier, and it will create two nice, smooth holes. 4) Insert the two straws or pen tubes into the newly bored holes on the bottle cap and secure them in place with the duct tape. One of the straws will be for inhaling and the second straw is there to act as a carb so you can clear out the vaporizer as you inhale. 5) Put the weed into the lightbulb. Preferably, the weed should be ground since that will make it easier to heat up all the weed (rather than one side of anug) and maximize the vapor yield. If you don’t have a grinder, click here to learn how to grind weed without grinder. 6) Screw the bottle cap onto the lightbulb. 7) Heat the head of the bulb with a lighter or candle. Make sure not to burn yourself! As you are heating up the weed, you’ll begin to see vapor being released. 8) As the vapor builds up, start inhaling. Inhale slowly so the weed doesn’t fly around in the bulb. Lastly, enjoy! The lightbulb vaporizer is probably the easiest vaping device to make at home, and there are many ways to improve on the technique discussed above. Some vape fans have thought up innovative ideas like a lightbulb holder, so you don’t have to hold the vaporizer up while smoking. In addition to the lightbulb design, you can use any small glass container that can be heated and capped. A small glass vial, for example, is handy formaking a homemade vaporizer that can be taken on the go. A lightbulb vaporizer is convenient and more affordable than a commercial vaporizer, but it is also small, and thus better for one or two people. Read on to find out how to make a homemade vaporizer for larger groups! 1) Take the knife and cut three holes in the mason jar lid. Two of the holes should be large enough to fit the hoses. The third hole should be wide enough to allow the votive candle holder to fit snugly into place. The votive will hold the weed for heating. 2) Take the duct tape and tape around the edges of the holes to create a more airtight seal. 3) If the candle holder comes with a candle inside it, melt and remove the candle wax, so you are left with a clear glass container. 4) Take the wire hanger and unwind it so that it is a long, pliable piece of thick wire. This will be used to fashion a stand for the mason jar. Press the middle of the wire against the neck of the mason jar, then wrap around the neck of the jar, once in each direction, so that it forms a ring around the jar. Take the ends of the wire and bend down to make a stand about 4” high, and then bend the wires again at ninety-degree angles to form the base of the stand. 5) Holding the mason jar upside down, place onto the stand. 6) Put weed into the votive. The weed should be ground to maximize the amount of vapor yield. 7) Fit the votive into the cap and screw the cap onto the jar. 9) Heat the votive to release the vapor. A lighter or a candle can be used with this method. A candle can sometimes be preferable since holding a lighter can get too hot to hold after a while. 10) Pass the vaporizer around to share with friends, and enjoy! The mason jar vaporizer can be made for a very affordable price. Since the jar is much bigger than a lightbulb, you can get bigger hits with a mason jar vaporizer, and the device is easier to pass in a group of friends. Check out the video from DJ Titofor a great demonstration of how a mason jar vaporizer can be made. As demonstrated by the two processes discussed above, making a homemade vaporizer is simple. If you have a glass container that can be sealed and can withstand heat from a flame, a couple of tubes or straws for inhalation and air circulation, a heat source and, of course, some weed, the possibilities for designing your own vaporizer are limitless.